Art Gifts, Santa, and Snacks. Oh My! 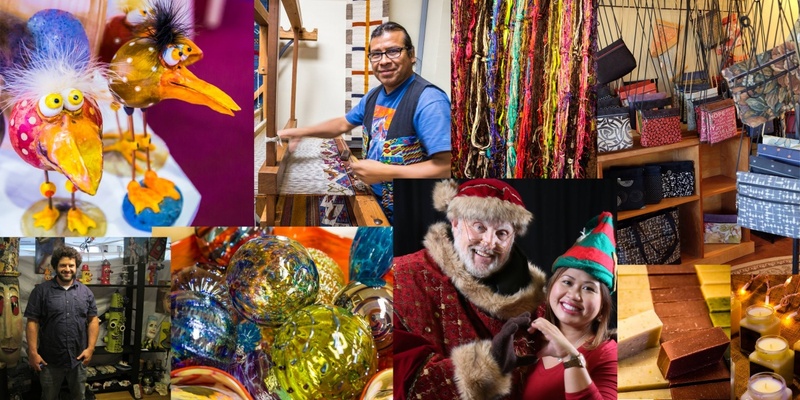 What do Santa, more than 100 artists and their original works, a heaping dose of holiday cheer, and a smorgasbord of delicious goodies by Ambrosia Cafe have in common? They’re all featured at Crocker Holiday Artisan Market 2017, to be held at the Scottish Rite Center this Thanksgiving weekend! The Crocker Art Museum is delighted to partner again this year with the Creative Arts League of Sacramento, in providing our community with an opportunity to shop for distinctive, one-of-a-kind treasures at the annual three-day event. Discover fine art and functional works including glass, fiber and textiles, wood, ceramics, paper, photography, painting, sculpture, jewelry, and even artisan chocolates! The artists and their original works have been carefully juried into this special event to provide you with an exciting shopping experience that is unique in the region; meet them and discuss their artistic journeys and processes. Speaking of journeys, embark upon a fruitful adventure and join the “Passport to Treasure”, an art giveaway “treasure hunt”, with stamping stations located throughout the venue and dozens of prizes donated by the artists. While you’re hunting, enjoy music by local musicians, performed throughout the venue, plus delicious bites from Ambrosia Cafe & Catering. And what family is event is complete without face painting and balloon tying? The Moonrise Pixies and Elves will be providing both! Santa will be there too (and you know how he loves the camera).